800 p., 18,0 x 25,4 cm. A high point of the history of the Reformation, the imperial diet in Augsburg in 1530, is so well represented in Melanchthon’s correspondence that it fills an entire volume. As the most influential Saxon advisors, Melanchthon stood in the very center of the action. In this way, besides the normal documents, a whole host of opinions written in common with other authors were written, bringing with them a variety of drafts in the official records and posing considerable paleographic and editorial problems. The correspondence with Luther in the Fortress Coburg has always aroused great interest, and its various copies and printings are presented here in complete form for the first time ever, edited according to the rules of modern text criticism. Other themes of this portion of Melanchthon’s correspondence include the development of the Augsburg Confession and its Apology, Melanchthon’s exploratory conversations with the opposition, the official attempts at reaching agreement in the various committees, and finally (after the imperial diet) the reevaluation of the right of resistance in connection with the formation of the Smalcaldic League. 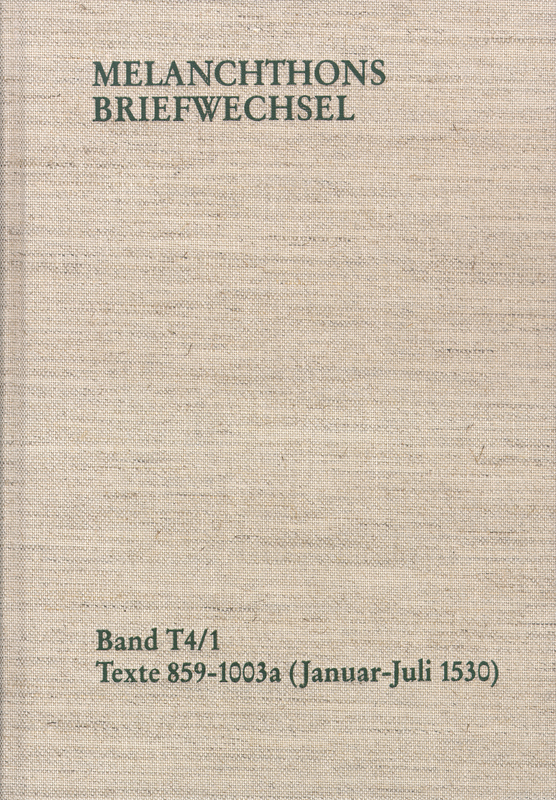 The critical edition of Melanchthon Briefwechsel volume Texte 4 is a fine, absolutely useful and indispensable work for every person dealing with Philip Melanchthon. Es ist schon jetzt abzusehen, dass diese vorzügliche und benutzerfreundliche Edition des Briefwechsels zu einer unentbehrlichen Quelle für alle wird, die sich mit den theologischen, politischen und persönlichen Bezügen der Reformatoren in jenem schicksalhaften Jahr beschäftigen werden: Ihre ausgezeichnete editorische Qualität verspricht ihr einen bleibenden Platz in der Forschung ebenso wie in der Lehre. Den Bänden T 4,1-2 kommt insofern eine besondere Bedeutung für die historische Forschung zu, als sie die Dokumente des Jahres 1530 enthalten, welches das Jahr des Augsburger Reichstags ist. Die Editionsarbeit unter der bewährten Ägide des Hauptherausgebers Heinz Scheible ist von gewohnt hoher Qualität.